I’ve had this recipe in my back pocket for a while now and I finally got around to whipping it together. The first time I had this dish was when Betsy and I hosted a brunch a while ago for some of her law school friends. One of them brought this deliciously wonderful thing that I’d never had before (Hi Westra!) and I made a mental note to get the recipe from her. Fast forward five months and I finally got around to A) getting the recipe and B) making it for you all. There’s a few things I love about this dish beyond the amazing flavor. First, it’s dumb simple to make. Second, it keeps and reheats fantastically which means you can make it on a Sunday and eat it all week long for breakfast… assuming it lasts that long of course. Oats soaked overnight and then baked and served with warm milk. Keeps well for a whole week of breakfasts. 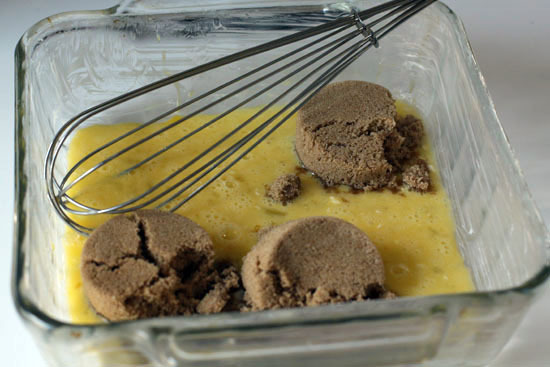 1) Grease or butter a 8×8 baking pan and then whisk together your eggs and brown sugar in the pan. 2) Melt butter on LOW in the microwave and add it to the egg mixture with all the ingredients excep the oats. Whisk well to combine. 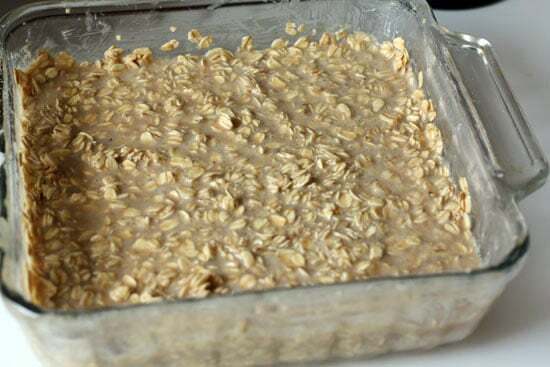 3) Stir in oats and make sure everything has an even consistency. 4) Cover and refrigerate overnight. 5) The next morning, bake the oatmeal at 350 degrees for 40-45 minutes until the center is set. 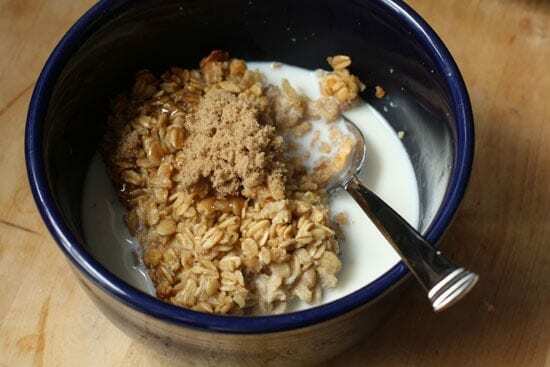 6) Let the oatmeal cool for a few minutes and then serve it with warm milk and, if you want, fun toppings like brown sugar, dried fruit, or nuts. This recipe is really easy, but it does require you to let the dish set in the fridge OVERNIGHT. This is non-negotiable people. Just plan accordingly. The good news is that it means you do all the work the night before so you don’t have to dirty any dishes the next morning. Most of the ingredients are pretty straightforward and you should have most of them if you have even a halfway stocked pantry. If you can, be sure to get fresh nutmeg and grate it yourself. It makes all the difference in the world. Grease or butter your pan really well and then add your eggs and brown sugar to the pan. 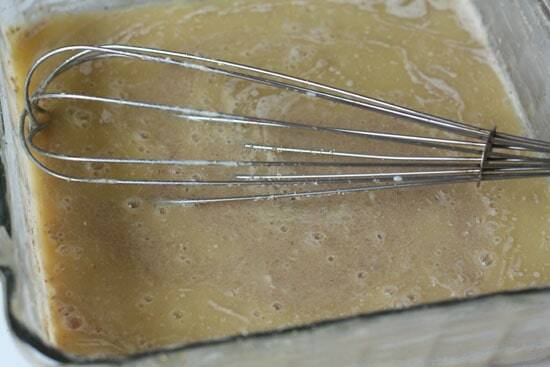 Whisk them together until the brown sugar is evenly distributed and there aren’t a lot of lumps. Melt your butter in the microwave on LOW so it doesn’t get too hot and then add it to the egg mixture along with all of your other ingredients except the oats. Mix this all together in the same dish! A whisk is your tool of choice here. Finally, add your oats to the party. Make sure to stir everything together. It should have an nice and even consistency. This needs to chill overnight! Plan accordingly. Cover this and let it chill out in your fridge overnight. 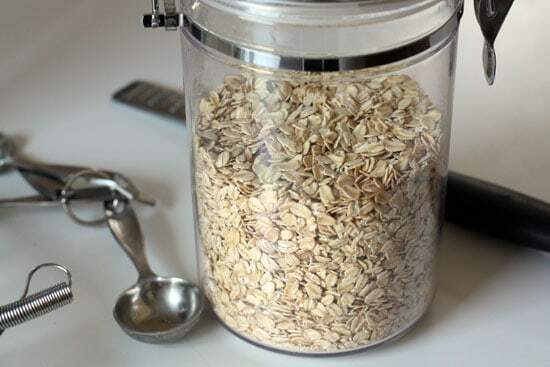 This will give the oats plenty of time to start absorbing some of the moisture and flavor. Plus it lets you do the work the night before! If you have guests over the next morning, it’ll make you look like a magician! When you wake-up the next morning all you have to do is bake this dish at 350 degrees for about 40-45 minutes or until the center is set. I baked mine for 40 minutes on the dot and it turned out perfectly. Let it cool for a minute or two and then serve it up in a bowl. If you want to go crazy you could of course add all kinds of toppings to it like dried fruit, nuts, or even some more brown sugar (like me). 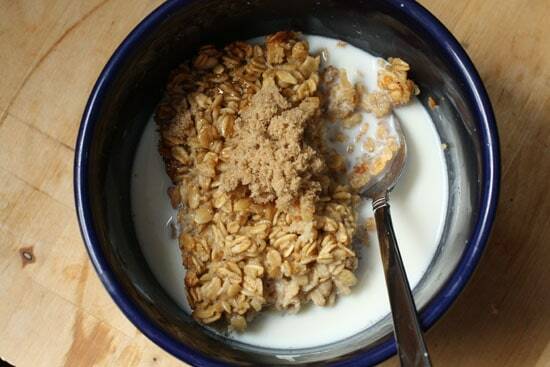 The key part though is to warm some milk while your oatmeal is cooking and then pour the milk over your baked oatmeal. The warm milk is really key. Really delicious and simple recipe. Even though it’s an overnight recipe, the actual work involved is minutes. It re-heats great as well. It’ll store in the fridge for at least a week without a problem. Or you could just slice off a cube of it cold and have yourself a dessert granola bar! Could it be? Something with the sweet chewiness of Oatmeal Raisin Cookies, without those darn pesky raisins. I'm on my way to check the pantry to see which ingredients I already have on-hand. i'm allowed one dumb question per month: does this taste like and have the consistency of granola? i've heard of this before and wanted to give it a go. but the way you describe it it sounds so good. i'm not a fan of granola unless there is a lot of stuff in it. but i might like this because it seems chewy like a oatmeal cookie? yes? If you just cut off a chunk of it cold, it kind of has the texture of granola. If you serve it warm with some warm milk though, it's not like granola at all. I'm not even sure I'd call it chewy… it's really good though! Normally I'm drawn to the craziest of your crazy-complicated recipes, but I'm lovin' the simplicity of this one. So simple…yet totally rad. I'm gonna give it a shot with almond milk! Okay, i alsready tried the Sweet Potato Hummus and was blown away and so were my two "Gluten/Wheat Free" little boys, so I had to see if we could change up their breakfast a little bit. BAM! Here we are after jumping up from my computer and making this for the morning. If I have to say so myself, this stuff even tastes good cold! I know a lot of you are saying not to consume raw eggs, but it smelled so good. I have to say that I had to change it up a bit. I used GF rolled oats, egg beaters, Oringinal unsweetened Almond Breeze milk, turbinado sugar, and GF French Vanilla Extract (didn't have any Vanilla). AWESOME!! I can't wait to taste it in the morning! tried it this morning ( prepared last night) and i found it heavenly. Breakfast for the next days is ready now.! I love the flavor of the spices in the warm milk coming all through my nose and my mouth. Thank you for making my mornings much more enjoyable ! It's like eating a giant oatmeal cookie for breakfast with milk and bananas. You have brought to my house many deliciousness-es. Do you think this is possible with steel cut oats? No insight into your question because I am wondering the same thing!! I just made the original, yummy, once that is done, I am going to try the steel cut oats. Sorry. Yea… I'm not sure that it would work with steel cut oats. They need a lot of liquid to soften. I think you would have to change the recipe pretty drastically to get decent results. There is a good recipe for soaked baked oatmeal using steel cut oats over at http://www.nourishedkitchen.com. I really want to try this, but was wondering how many servings you get out of a 1 1/2 quart dish? I'd guess it's around 6 servings. Hello There! This is my second round at the baked oatmeal madness. This recipes OWNS that other one. 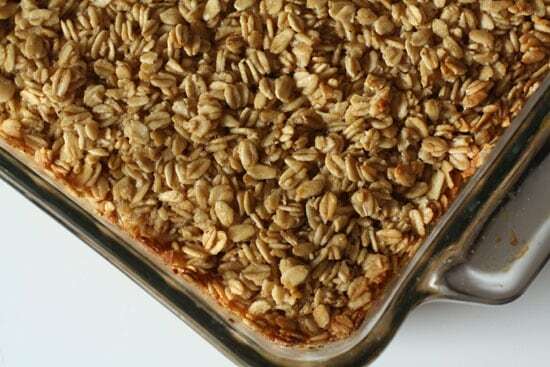 I want to be buried with this baked oatmeal. Please, thank you, AMEN. I have so far eaten this for all meals while watching hoarders' marathons. 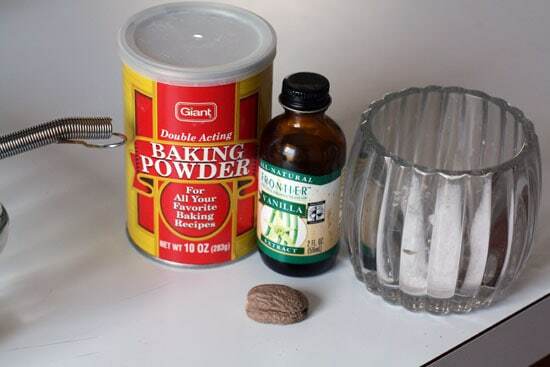 I hope this does not discourage you from posting more recipes. I love baked oatmeal, and this is a new version. Just to be certain, because it isn't mentioned in the mixing process, you're not actually adding the called-for milk to the baked oatmeal itself, you're only warming it and pouring it over the top? Oh never mind now I see the milk step … "all the other ingredients." Doh! ! I'm making this tonight! Oh… My… God… There are no words to describe how perfect and wonderful this recipe is. I am very concerned that I will be eating way too much of this in the near future. Still, I thank you and my wonderful fiance for bringing this into my life! Hi, I was wondering if you would suggest a shorter cook time if using a coated pan? Thanks!! Thanks for sharing, it turned out delicious this morning. Tweeks for me: Added one small chopped gala apple and 1/3 c. raisins. Decreased brown sugar to 1/2 c. thinking I might sprinkle more on but was plenty sweet for this sweet tooth w/o any more. Yummy on a snowy CO morning! This has become my go-to breakfast. The first time I made it I liked but didn’t love it because the texture is so different from regular oatmeal (which I do love). But when I made it again, I was prepared for the difference, and really enjoyed it, particularly the leftovers. Recently, I’ve been adding pumpkin puree (~1 cup) and reducing the sugar to 1/3 C brown sugar plus 1/3 c maple syrup. It is fabulous reheated, and I portion it out (6 servings) for breakfasts on the go (I’ve been taking breakfast to work with me lately rather than eating before I leave). I love the idea of adding apples and dried fruit – too bad I’ve already mixed up my batch for tomorrow. Next time! That’s awesome Amy! I love your changes. Thanks for the comment! I made this yesterday for the 3rd time. The 1st time I did it just as written above, it was good. 2nd time I made the eggnog version you posted on another site, it was good. 3rd time I added chopped apples and raisins, my almost 7 year old son told me in no uncertain terms it was “the best breakfast ever!” . Thanks for all the awesome recipes I love this blog! Made this for the second time…. I usually use steel cut oats but only had rolled oats so needed a new recipe. I added raisins and chopped up a banana and mixed that in also. Can’t wait for tomorrow morning! omg, i f’ing love this recipe. I have made it several times and even made it last weekend. But this time I burned it. And guess what? It still came out amazing! This was a truly inspired post. And I’m sure you still get a lot of hits for it even two years later. YUM! I’ve had this recipe bookmarked, and now that I am moving to a new house this week and have NO extra money for food, I had to make due with what was in my pantry. Enter this surely awesome recipe! 1. are you supposed to bake it covered with foil, or uncovered? 2. In the printer version, both an 8×8 and 9×9 pan were mentioned – does it matter what size? 3. What about adding raisins? Would you let them soak overnight, or add them before baking? 4. If subbing pumpkin puree or applesauce, would you remove the eggs, or milk, or both? 5. What about adding frozen fruit? I have a lot of berries from the summer – I’m guessing that if I add them at the beginning, they will thaw in the fridge overnight and be ready for baking w/o affecting the temperature too much? I will try a few variations, but wondering if anyone had any experience with these variations? Hey Megan, here are my best answers! 3) I think you could do that. I would soak them overnight. 4) Hmm… i’m not sure on that. part of the appeal of this dish is the custard-like texture which i’m not sure you could get without the eggs. You could definitely add some pumpkin or apple sauce but i’m not sure I would get rid of it. 5) I’ve never added berries, but I don’t see why you couldn’t! baked oatmeal had never crossed my mind before.. i’ve now made it a few times with some different ingredients added in. diced apple was probably my favorite addition.